It’s a common problem affecting around 50% of both men and women. If you’re worried about your hair, and would like to gain more volume and have fuller-looking hair, then chat to your stylist about Nioxin. All these factors can play a significant role in thinning hair. If you feel your hair is looking or feeling thinner then book in for a complimentary scalp examination. One of our specially trained team will examine your scalp in detail using our Nioscope, and recommend a course of treatment using the Nioxin range of hair products. The Nioscope is a small handheld microscope that takes pictures so we can really see what’s going on at the scalp. Nioxin is an innovative product range which delivers fuller-looking, thicker hair without side-effects. It’s a real confidence-booster. It takes its inspiration from premium skin care – as an extension of your facial skin your scalp requires the same attention and treatment. Nioxin strengthens, nourishes and repairs the scalp, as a healthy scalp creates healthy fuller-looking, thicker hair. 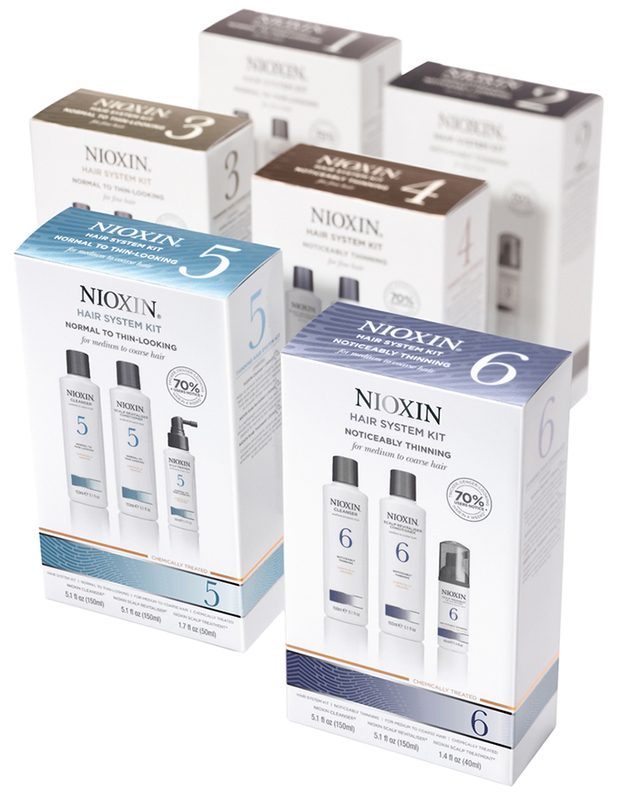 The Nioxin range includes six, 3-step hair care systems. Your stylist can advise on which system is best for you, depending on whether your hair is coloured, chemically treated and its texture. Each Nioxin hair care system has a Cleanser (shampoo), Scalp Therapy (conditioner) and Scalp Treatment (left in the hair after washing). Experiencing fewer hair strands is one of the first signs of thinning. With less support from the surrounding hair, ‘gaps’ can appear in the overall silhouette. Hair goes through three growth phases. For new hair to complete all three phases and reach maturity the scalp needs be kept clean and the hair protected from breakage and damage -one of the most common causes of thin looking hair. Nioxin removes the follicle blocking sebum from the scalp . Fine hair strands are often at early sign of thinning hair. They indicate lower keratin levels which result in a weaker hair structure which is unable to control its own weight, so your hair appears fluffy or falls flat. In contrast, when hair completes its full life cycle it looks full and thick. However changes in our diet, stress, health and living environment can shorten the hair lifecycle, preventing it from maturing and causing regression to smaller finer hair. Nioxin helps reduce hair loss due to breakage. A healthy scalp environment supports healthy hair growth. Healthy, deep-rooted hair comes from a scalp that is both clean and free from debris. If sebum and hair products are allowed to build up they block the hair follicles and can prevent new hair coming through the skin and maturing. Over time, this lack of new growth will make your hair look and feel increasingly thin. Nioxin amplifies hair texture delivering full-looking thicker hair. Book your complimentary Nioscope scalp examination on 01926 429584 and discuss a personalised plan for your thinning hair with one of our experienced professionals.